The process of floatation therapy facilitates an environment that allows the human body to work unencumbered, bringing itself back to optimum health much more effectively and efficiently than any other form of rest. Effortlessly floating on top of a dense, super-saturated solution of Epsom salt and water creates a weightlessness that allows the muscular, skeletal and circulatory systems to rest in a zero gravity environment. The act of floating allows the muscles to completely relax and the spine to decompress and realign. With this type of weightlessness, the circulatory system is able to more easily pump blood to areas of the body that are normally difficult to reach when the heart and vessels are working against gravity. In turn, the blood flow to the lymphatic system is increased, causing the waste-maintenance system to operate more effectively. This detoxification process encourages lymphatic drainage, diminishing the appearance of cellulite and resulting in vibrant, glowing skin. The high concentration of Epsom salt in the water exfoliates the skin, but also restores and maintains its moisture and electrolyte balance. When blood flow to the muscles is increased it helps to dispose of lactic acid, which diminishes soreness and accelerates recovery time for athletes and fitness enthusiasts. Epsom salt is the commonly used term for magnesium sulfate. Separately, each minerals is involved in key functions that maintain basic health. Magnesium helps to regulate hundreds of enzymatic systems, including blood glucose balance and blood pressure control. It is also correlated with the nerve impulse processes that manage muscle movement and normal heart rhythm. Sulfates function within the body as a conduit to build proteins in our joints, brain tissues, and muscles. They can also work as a detox powerhouse, aiding the release of toxins from the body. Magnesium sulfates maintain the basics: blood pressure, breathing, and heart rhythm, and although these processes may go unnoticed for many, a flaw in any of these systems could factor into a variety of medical concerns. When we float, the minerals found in Epsom salts are easily absorbed through our skin for utilization by all of our major health systems. 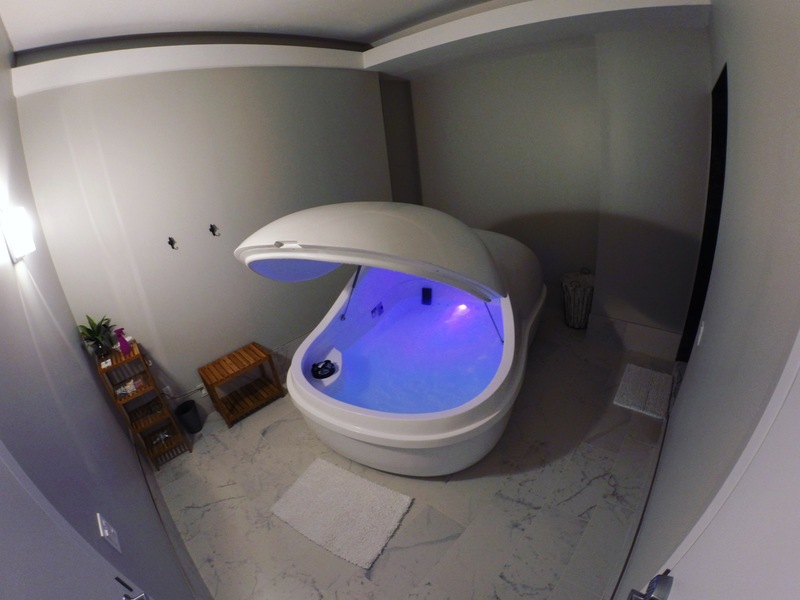 A session in one of our float pods allows for a sensory deprivation experience that will allow you to escape the stresses of a fast-paced life in a society where we are bombarded with constant stimuli. Sensory deprivation can help to balance the brain’s function. The normally dominant left hemisphere of the brain is forced to relax when there is such a reduction in sensory input, which then increases the activity of the right hemisphere. This will allow the two cerebral hemispheres to synchronize with one another, creating a sense of harmony, balance and clear-headedness. The emphasis of right brain activity can result in increased creativity, big-picture thinking and problem solving. Floating also encourages theta wave activity in the brain, which Tibetan monks are only able to achieve after many years of disciplined meditation. These rhythmic waves are relaxing and reflective. One hour of rest in the floating theta state is equivalent to approximately four hours of R.E.M. sleep. The extreme relaxation experienced while floating releases endorphins and serotonin, neurochemicals associated with happiness as well as stress and pain reduction. 1. Avoid shaving, waxing, tanning or laser hair removal or any other activities that may increase the sensitivity of your skin before your appointment. 2. We advise that you do not have caffeinate or alcoholic beverages prior to your session. 3. Females experiencing their menstrual cycle the day of the float must reschedule their appointment. 4. We suggest that you eat a small meal or snack 30 minutes prior to your float to avoid the distraction of a hungry stomach. 5. Please do not schedule a float if your hair color or tint is not completely set, your shower water should run completely clear. 6. We suggest a visit to the bathroom before your float to ensure total comfort during your 60-minute session. 7. We prefer that guests do not float in clothing or swimsuits that have been laundered with fabric softener. 1. Most people float without clothing of any kind, but you are welcome to wear swimwear if that makes you more comfortable. 2. We recommend you wear comfortable clothes to your appointment that are easy to change in and out of. 1. We provide shampoo, conditioner, body wash, Q-Tips, earplugs, towels, and a face cloth. 2. We offer dressing rooms equipped with a hairdryer for your convenience. Please be aware that other guests may be waiting to use the dressing room, so we encourage a timely turnover. 3. We offer dressing rooms equipped with a hairdryer for your convenience. Please be aware that other guests may be waiting to use the dressing room, so we encourage a timely turnover. 1. Please arrive 15 minutes before your scheduled appointment time. 2. If you are a first time guest at Frost and Float Spa, a staff member will walk you through all the steps of a float experience. 3. 10 minutes is allowed for Pre-Float preparation. 4. You will shower before you enter the pod. (Shampoo & soap will be provided.) Please be sure to rinse thoroughly to ensure our water remains pristine. 5. Ear plugs will be provided and we encourage our clients to use them. If you choose not to wear them, please rinse your ears for 5-10 seconds each at the conclusion of your session. 6. Your session begins 10 minutes after you enter the room. 7. You may leave your Pod’s lid opened, propped or closed for your float. The lid is on hydraulic arms and opens easily when pushed. 8. Once your session has started you will have access to your control buttons—including your light and music. You are in full control of your light (which features a variety of options.) We recommend turning it off for the deepest experience—but this will always be up to you. 9. To enhance relaxation we offer 10 minutes of soothing music to start—and wrap up your session with five minutes of music at the end. 10. You may also bring your own music for your floats or opt for alternate music options in the future—ask your float consultant to show you how! 11. Refrain from touching your face while in the Float Pod to avoid getting salt in your eyes. That being said we provide squirt bottles of fresh water in each pod as a precaution. 12. Initially pain or tension in the body may seem more noticeable. This is due to the Float’s ability to eliminate the typical distractions we face. Simply breathe and know that this is normal. As the session progresses sensations will dissipate. 13. The float has ended once your Pod’s filtration system comes on and the water starts to move. 14. Don’t worry if you doze off and miss your queue to exit, we will let you know the session has ended via your Float Pod’s intercom! 1. At the conclusion of your float, shower again to remove the salt from you body and hair. 2. 10 minutes are allowed for showering and dressing. 3. If you anticipate that you will need more time, please let us know and we will provide a robe so that you may move to a dressing room. 4. Please place your used towels and wash clothes in the basket provided in your room.